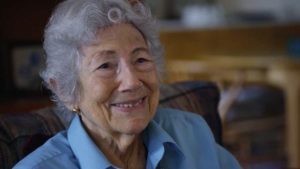 Evelyn Witkin earned her BA in zoology from NYU in 1941 and started her graduate studies at Columbia University where she joined Dr. Theodosius Dobzhansky’s laboratory. She was interested in studying Drosophila genetics, but her interests changed when she realized that bacteria also have genes. She went to CSH in the summer of 1944 to start her studies in bacterial genetics, a decision that shaped her scientific career. At CSH she isolated, for the first-time, UV-resistant E. coli. After graduating in 1947, she continued her studies in bacterial genetics. In 1971, she joined the Biology Sciences department at Rutgers University and continued working on DNA mutagenesis in E. coli. In the early 1970’s, in collaboration with Dr. Miroslav Radman, she discovered the SOS response to UV irradiation in bacteria. For her work on mutagenesis and DNA repair, Witkin was elected to the National Academy of Sciences in 1977. She was awarded the U.S. National Medal of Science in 2002, and the Albert Lasker Basic Medical Research Award in 2015.